NANTA Review : Where 'Cookin' comes alive! NANTA (난타 also known as Cookin or Cookin’ Nanta) is in town cooking up a storm. For those in the dark, NANTA is South Korea's longest running show and number one show since 1999. It's a live non verbal comedy performance from a cast of 5 that serve to entertains with their acrobatics skills , magic and skills with the knives. Get set for Master Chef meets STOMP! NANTA has been a regular staple in packaged tours to South Korea from Singapore. It is still on some tour packages today. On our last trip to Korea, we had managed to catch a glimpse of it. A glimpse because the tour was delayed and we missed at least 1/2 the show. Thus when we heard that NANTA is back in town, it was hard to resist the opportunity to catch what we missed. Marinating Korea Culture in one mini buffet of fun performance. NANTA moves to the beat of Korea rhythms to entertain and delights the audience. The story line is simple to follow. Three chefs are task to complete a wedding banquet in a limited time. Along the way , they are joined by the manager's nephew to complete the task. Would they be able to make it in time? From drumming with knives, juggling with kitchen utensils to comical audience participation, NANTA woos the audience with its slick and polish performances that is fresh and delightful. Judging from my elder boy's laughter, claps and cheers, it would be easy to say that kids would love it too! 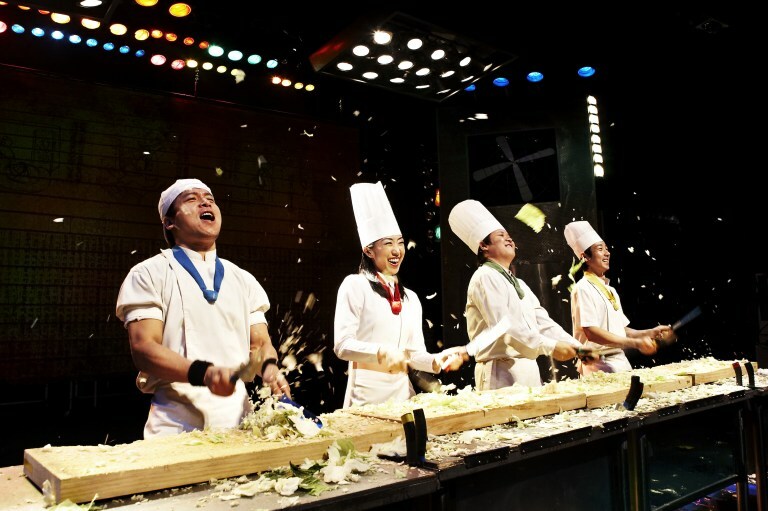 For a taste of lighthearted Korea comedy, do head down to Resort World Theatre, RWS for this limited run. NANTA will only be in town for the next 2 days only. Limited tickets are still available here. It you missed this show, there will be another Korean performance , The Painter at RWS next Friday and Saturday. Can't wait to catch that too!